"A speech doesn't have to be long!" said fellow speaker coach Peter Botting when he sent this video my way. 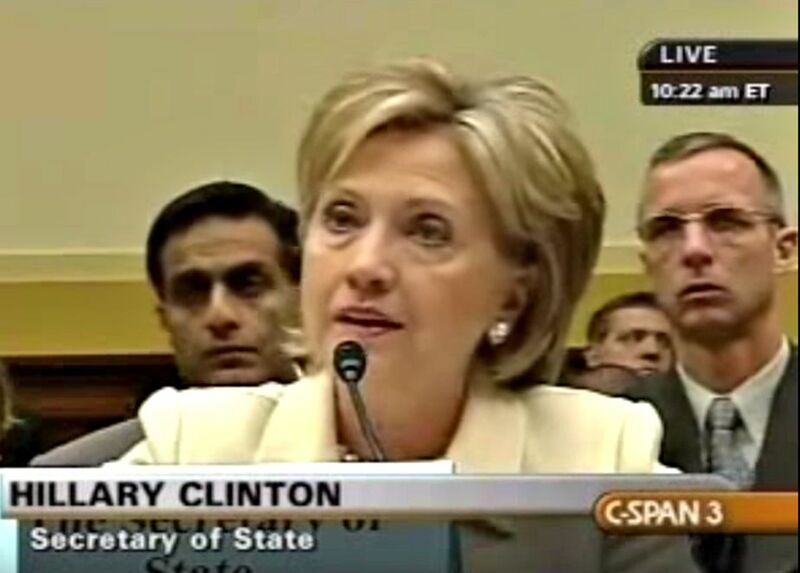 It's a tough question posed by a Member of Congress during a 2009 hearing in which Hillary Clinton was testifying during her tenure as U.S. Secretary of State. Representative Christopher Smith: My question: Is the Obama Administration seeking in any way to weaken or overturn pro-life laws and policies in African and Latin American Countries, either directly or through multilateral organizations including and especially the United Nations, African Union or the OAS, or by way of funding NGOs like Planned Parenthood, and secondly, and so we can have total transparency, you know, as a former lawmaker, we always have definition pages when we write legislation, definitions do matter, does the United States definition of the term,"reproductive health" or "reproductive services" or "reproductive rights" include abortion? I yield to the distinguished gentleman. Secretary Hillary Clinton: Congressman, I deeply respect your passionate concern and views, which you have championed and advocated for over the course of your public career. We obviously have a profound disagreement. When I think about the suffering that I have seen, of women around the world, I've been in hospitals in Brazil where half the women were enthusiastically and joyfully greeting new babies and the other half were fighting for their lives against botched abortions. I've been in African countries where 12 and 13 year old girls are bearing children. I have been in Asian countries where the denial of family planning consigns women to lives of oppression and hardship. So we have a very fundamental disagreement. And it is my strongly held view that you are entitled to advocate and everyone who agrees with you should be free to do so anywhere in the world. And so are we. We happen to think that family planning is an important part of women's health. And reproductive health includes access to abortion, that I believe should be safe, legal and rare. I spent a lot of my time trying to bring down the rate of abortions and it has been my experience that good family planning and good medical care brings down the rate of abortion. Keeping women and men in ignorance and denied the access to service actually increases the rate of abortion. During my time as First Lady, I helped to create the Campaign Against Teenage Pregnancy. And while we were working to provide good information, access to contraception and decision making that would enable young women to protect themselves and say no, the rate of teen pregnancy went down. I'm sad to report that after an administration of eight years that undid so much of the good work, the rate of teenage pregnancy is going up. So we disagree. And we are now an administration that will protect the rights of women including their rights to reproductive health care. It's a Q&A that is just shy of 3.5 minutes in total, and it's up to 2.7 million views on YouTube at this writing, as much as a major TED talk. What can you learn from this famous speech? Acknowledge where you do and do not agree: Why not be clear about what everyone's thinking? Clinton underscores, at the top and bottom of this answer, the fact that she disagrees with the premise of the question--a good tactic for responding to a leading question, one that takes the "gotcha" out of the gotcha question. Note that, in doing so, she is careful to point out that those who disagree are free to express those views freely--she's clear that, in putting her view forward, she isn't stifling anyone else's opportunity to disagree. It's a confident, clear stance. Don't match an anxiety-provoking question with an equally anxious answer: The congressman's question, while respectfully delivered, is formulated as a classic "gotcha" question. In effect, it asks Clinton, "Can you testify truthfully that you are not doing this?" In her calm, non-anxious response, she aligns herself with the question by saying "we disagree" rather than many other options she might have chosen. If you don't let the question make you visibly anxious, your answer will carry more weight. Answering need not mean agreement, even though many speakers assume that to answer means they must agree. Not so! Use "I" statements to speak for yourself: She is, after all, giving testimony, so it's appropriate for Clinton to speak about what she has observed around the world. Doing so with "I" statements avoids any hint of attempting to overstate agreement with her viewpoint, while subtly sharing the views of affected women via her observations.